“I learned that death on a cross is a martyrdom, but that resurrection is a gospel. I learned that if there is such a thing as a resurrection, nothing else matters. Reflect upon this one simple, profound sentence from the Bible. It tells us of one message but two groups of people. The one message is the cross. In its simplest form it is the news that God loves you so much that He sent His Son, Jesus Christ, to come into this world, live a perfect life in which He fulfilled every righteous demand of God’s law, and go to the cross and die in your place. In those moments on the cross you were on God’s mind. He placed your sin upon His Son. Jesus was taking your place. Your sin was placed on Him and all the wrath and judgement of God that was due you, was poured out on Jesus instead. And when God’s justice was satisfied, He sent forth this “word of the cross” to you to let you know He loves you and He is willing, because of Jesus, to receive you back as His child. There is one message—it is Jesus, His cross and His resurrection. But there are two groups of people. Wherever that message is spoken there are ever only two groups of people. There may be many different ethnicities represented in the crowd, there may be both single and married people listening, there may be religious people and non-religious people hearing that one message, there may be the rich and the poor (and the many other distinctions we make in this life)—but there are in God’s eyes really only two groups of people present. One group is in the process of perishing. That means they have not yet completely perished. In fact they will be in various stages of that process—some will feel most acutely the weight and consequences of their sin while others may sense very little of it. Sin’s consequences may have so eaten away at some of their souls that society does not even want to notice them. Others may have cleverly hidden the effects of their sin from their eyes and the eyes of their friends and family, yet on the process goes. Make no mistake about it, they are all in the same process, headed for the same eternal result. There is, however, another group in the crowd—“us who are being saved”. Noticed “being saved.” Does that sound funny? The Bible actually describes salvation in three tenses—we “have been saved” (Eph. 2:5), we “are being saved” (1 Cor. 1:18) and we “will be saved” (1 Cor. 3:15). Those three tenses help us understand what it is this message of the cross is to mean to us and how it may change us. 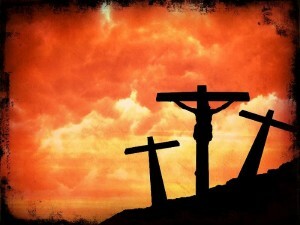 In one sense “we have been saved.” It happened on Good Friday and Easter. When Jesus Christ died, He did everything that would ever need done for your sin. You can’t ever add one thing to what Jesus has done to improve it. He does not ask you to enhance it by your good works or by your religious efforts. Either what Jesus did in His death and resurrection is enough for God or we are sunk. It all banks on what was done in the past. But in one sense “we are being saved.” It is a present experience. 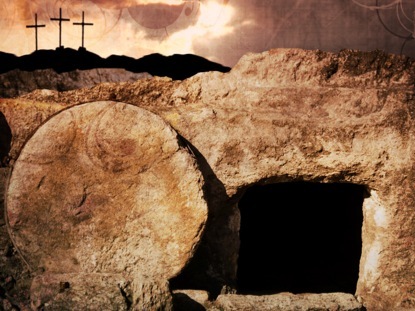 Jesus not only died, He was raised from the dead. He is alive. He is here. And He wants to begin changing your life starting right now. We are “being saved” when we trust Jesus Christ with everything, every moment, every day. We are “being saved” when we acknowledge by faith His presence with us and bank our every moment upon His living relationship with us. But the Bible also says we “will be saved.” After Jesus rose from the dead He promised He would come again. Every one of us will stand before Him—either after death or upon His return—and as we stand before God Almighty we will need to be saved. What happens now and what happens in the end depends completely upon what we believe happen back then.